I've got the curlers and everything! I'm in the amazing show Never Cry Wolf. Opening Night wasn last night. We did pretty ok.
but today we have a matinee and an evening show. I've got a half hour before i need to leave for the Matinee. GOOD LUCK! I bet you are having so SO much fun in a play, I lOVED stuff like that. I still do. I LOVE that you are using those curlers... mom probably bought those in the 70's. I loved it when mom put them in my hair and my hair was all curly for church! I hope you will post lots of pictures from your show! 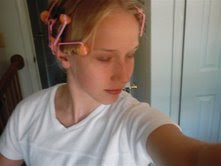 I was actually thinking about those curlers the other day wishing I still had them...ahhh. Good luck amanda, I'm sure you're a rockstar!! I wish we could be there for the play! I bet you were fantastic! I need to get some of those curlers for Brielle...it takes me back to my childhood! I wore those curlers too when I was a little girl. They work so well! The Many Faces of Benson.